NEXCOM vehicle mount computer VMC 110 series assists commodities transportation enhancing operational efficiency and fleet safety. 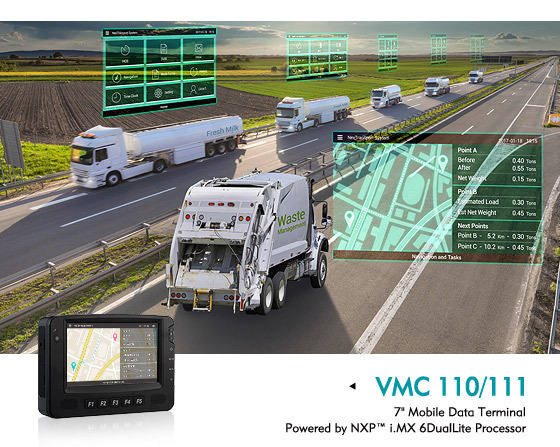 Based on NXP™ i.MX 6DualLite processor, the VMC 110 works in Android operating system embodying navigation, fleet telematics, and electronic logging by combining real-time GPS tracking, wireless communication, and complete vehicle diagnostics to control and manage freight such as dry and liquid materials, ranging from waste to the food industry. The VMC 110 secures traceability facilitating managerial operations from collection to delivery with real-time GPS and optional dead reckoning support. Managers can monitor fleet positions, implementing geo-fencing, submitting new requests and updates to drivers on the road through wireless communication. The VMC 110 enhances the billing system by recording and computing weight as a common practice when transporting waste, food, cement, liquid and dry goods. Commodities carriers can boost safety and efficiency, recalculate routes, prevent on-transit loss, and improve their bottom line while protecting their assets. The vehicle mount computer achieves safety of drivers, goods and assets by collecting plentiful data. Fuel level, power take-off, engine hours, and odometer readings through two CAN bus interfaces maintain driver vehicle inspection reports (DVIR) to avert mechanical failures, with optional onboard diagnostics II (OBDII). The 7-inch LCD monitor gives drivers a comprehensive visualization of location, tasks, and loads, along with an electronic logging system to ease pick-up and delivery processes. The iButton function automatically identifies the assigned personnel to prevent unauthorized use. Drivers can also alert the control center about extreme situations with the panic button. The compact and ruggedized design of the VMC 110 permits adaptability to any harsh environment and extreme temperatures to excel at operations, monitoring, control and management. The VMC 110 allows expansion through an externally accessible microSDHC slot, with an optional additional battery, and extensive I/O support to connect with a variety of vehicle sensors and peripherals. Considering the limited space in cabins and the different installation constraints, the vehicle mount computer VMC 110 series delivers two models, where the position of the I/O interface is on the back for the VMC 110 and on the bottom for the VMC 111.